Lacombe Days was a great success for our historical society. With all 3 museums open we were never short of visitors, and even had a group of over 20 people for one of the guided walking tours of our historic downtown. Thank you to all the volunteers who helped us make Lacombe Days 2013 a success! 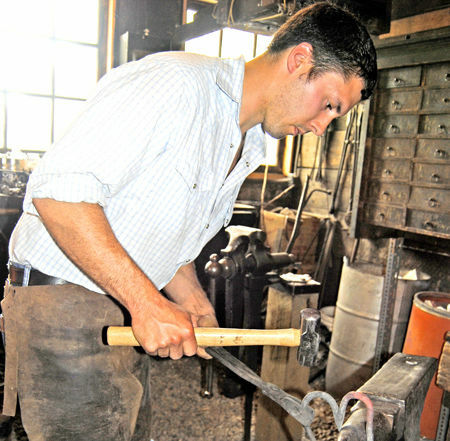 The blacksmith shop was very busy giving live tours and demonstrations. Click the link below to read what the Lacombe Globe has to say about it! Two of our summer students gave free walking tours, and also made it into the local news. On the Lacombe Globe's website you can read a brief article about Seth and Sayde (the link is posted below.) They will continue giving daily walking tours at 10am and 2pm for the rest of summer. The costs are $10 for adults and children 16 and under are FREE. The tours are 45 minutes, and will teach you all you need to know about downtown Lacombe and the Murals. Old car and old costumes. Getting ready for the parade.